Hawks Soar Over Bucks ~ The Bucky Channel - The World of Sports from Wisconsin's Perspective. It was Mike Bibby of all people who scored nine straight points on three straight tray balls in the late first quarter to put the Hawks out in front by a decent margin. The Bucks fought back every quarter, but as the Bucks got close the Hawks would go on anther run. The Bucks just couldn't get over the hump, but they did show a lot of heart. 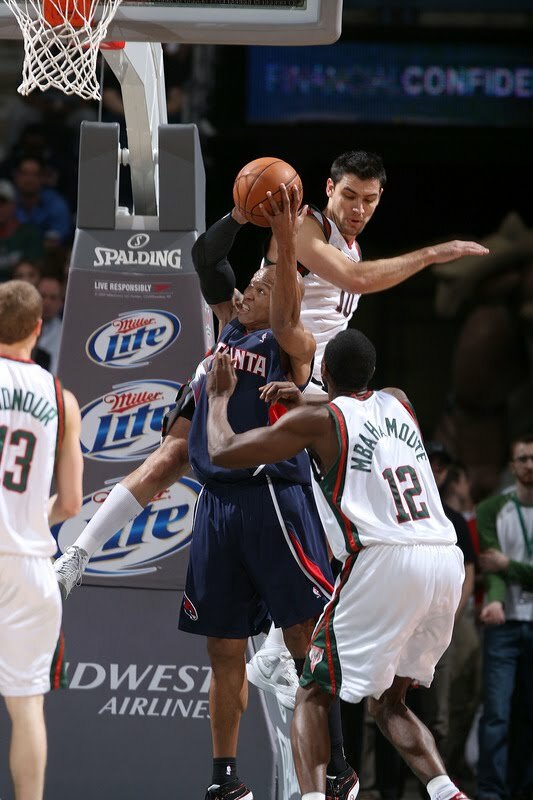 In the second quarter the Bucks cut the Hawks lead to one at 40-39, before Atlanta built a seven point lead at halftime. In the third quarter the Bucks cut the lead to four at one point down 63-59. Right after that the Hawks got the lead to as big as ten. They finished the quarter up by eight, and things didn't look good for the Bucks. Also while we were in the third quarter we learned that the Heat beat the 76ers to take over the 5th seed in the East, so this was a big game for the Bucks as far as playoff seeding was concerned. Well, after that news the Bucks still came out flat early in the fourth quarter as the Hawks got out to an early 82-70 lead. I really felt that this one was over when we were down twelve that early. Well I was wrong again as the Bucks the line up of Jennings, Ridnour, Salmons, Delfino, and Thomas worked well together. The only problem is they were very small with these guys in. Either way the Bucks got this game back to a two point game down 89-87 with just under five minutes to go. After that Al Horford and Marvin Williams went to work on the Bucks down low. Those two scored the next nine points all on lay ups except for one Horford free throw. Milwaukee on the other hand was cold in the final five minutes. With the loss, it looks like Milwaukee will be playing these Hawks in the first round. Anything could happen, but it looks like the Celtics would have to win out to get the three seed. Either team we play it won't be easy, but the Celtics are hurting a little bit so that might be the only plus of playing them. As for the Hawks well Horford did have a tough time with Thomas early so that might be the plus if we play them. With one game left we will know for sure Wednesday night. Lets check out some highlights from this 104-96 defeat. * John Salmons continued to lead this team with Bogut out. He finished the night with 28 points, 3 rebounds, and 2 assists. Salmons is doing a good job of scoring for the Bucks, but someone else needs to step up. Salmons will get the Bucks POTG for his efforts Monday night in Milwaukee. * Brandon Jennings did score, but took a lot of shots to get all his points. He finished with 21 points, 5 assists, and 4 rebounds. He needs to start hitting more shots, or else drive to the hole to maybe get fouled to get to the line. * Erson Ilyasova needs to be more physical down low if this team wants to make it far in the playoffs. He was 2-11 from the field, and seemed to get owned every time he drove to the lane. One of the times he drove to the lane for a lay up Joe Smith put the ball in the 12 row of the Bradley Center. * The Bucks have only scored 100 points once since Bogut has been out. That was against New Jersey, so not sure that even counts. So if this team wants to win they need to play better defense to hold teams to under 100 points. * All five starters for the Hawks scored in double figures. By now I hope everyone knows that I love when five or more people score double figures for a team. Also it usually means that team wins the game, and that happened again Monday night as the Hawks won. * Joe Johnson just does work when he faces the Bucks. He did it again Monday as he finished with 31 points, 7 rebounds, and 3 assists. Easy pick for the Hunter of the Night for Monday nights game. Well the Bucks lost their last two games to teams they they may have to face in the playoffs. That is not a good thing, but this isn't the playoffs yet so lets not be to worried. Also it is good to see that we have been in both these games until late in the fourth quarter. Lets hope that the Bucks can figure out what they need to do to get over the hump, and beat these teams. On Wednesday night the Bucks finish the regular season against the Boston Celtics. It doesn't matter if its the 5th seed or the 6th seed, because your Milwaukee Bucks will be in the playoffs this year, and maybe they can do some damage. Can't wait to find out.